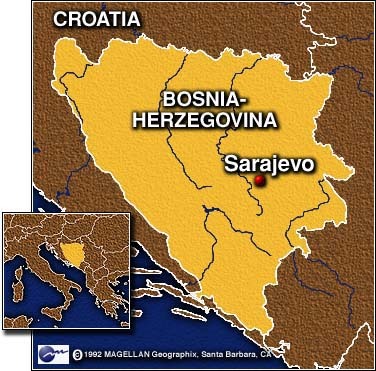 SARAJEVO, Bosnia-Herzegovina (CNN) -- In a city still recovering from war, in a country still split by ethnic hatred, there can be few things more promising than the event that will take place Tuesday night in a Sarajevo stadium. U2, one of the world's most popular and globally conscious bands, will perform a concert in a stadium that once was a target for Bosnian Serb guns. More than 45,000 fans are expected to attend. "This is not a normal city," says Miro Purivatra of U2's Sarajevo office. "We are faced with water shortages, no electricity ... imagine what it takes to prepare for the show." Imagine the 22 miles of cable that had to be strung, and the 1,000 light fixtures that had to be hung. No wonder a small army of 300 international staff arrived by day and night to help put the show together. 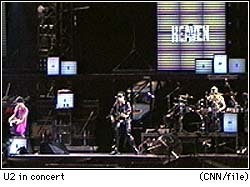 "The U2 show is quite substantial," said Steve Iredale, U2's production manager. "We have 90 trucks in Europe, and at the moment 51 trucks are here ... we hope. It's an enormous amount of resources that we depend on." Roughly 300 Sarajevo residents are on the payroll, doing everything from putting up posters to selling tickets. Even the famous Sarajevo trams are part of the act. During the war, they were a symbol of normalcy. Now they are moving billboards, every car plastered with U2 posters. 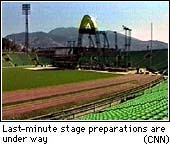 NATO troops who are in Bosnia to keep the peace will attend the concert to beef up security, but the only problems they expect are with their eardrums. "I think the loudness of music is a problem," says Lt. Col. Ted Strauss with a laugh. "No, I don't think there's any threat." Which is, of course, what Sarajevo concert-goers want to hear. The only explosions they are interested in will be the loud music of one of the city's favorite bands. 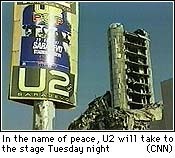 People here remember that it was U2, an Irish band, that raised its voice in protest against the Bosnian conflict and helped raised the consciousness of audiences around the world about the war. And that is why local music lovers have no qualms about paying $15 for a ticket. They relish the opportunity to thank the band in person, and to celebrate what they hope is another step toward solidifying peace. Further magnifying the event, and the cause of peace in this uneasy country, is the fact that a few hundred Bosnian Serbs will cross what once were the front lines of battle to attend the concert. It is the hope of the band and the concert's organizers that all ethnic differences will be left outside the stadium. "We were in war for years," says a woman in a Sarajevo nightspot. "This is proof that we have peace here, that everything is OK."